If I had a pound for every time I’ve heard someone say football matches should only be played at 3 pm on a Saturday, I could give up having to use astrology to gamble on them. Football fans are a notoriously conservative bunch, but it is a religion after all and the timing of rituals is important. The first time a game was played on a Sunday was at Millwall, an institution with a fine respect for the traditions of football. It was on January 20th 1974. There was scheduled to be a dozen football league games that day, but down at the Den they decided to get ahead of the bunch by bringing kick off forward to 11.30. Such a momentous break with tradition is shown by the Sun in only the 2nd minute of rebellious Aquarius in square aspect to Uranus. The Moon is in future thinking Sagittarius but it receives an opposition from Saturn. Understandably this game attracted criticism from lots of people, particularly Christian groups, who should have known they were fighting a losing battle as their own Saturn was retrograde in the last degree of Gemini. The Lord’s Day Observance Society argued against it, chiefly on the grounds that the Creator had a rest on the 7th day, sat back and observed her creation and pronounced it good. Of course this merely raised many more objections along the lines of how could mankind have materialised inside a week when we have proof that the dinosaurs were around a hundred million years ago. And also that it took Jose Mourinho 2 goes over 10 years to create a legacy at Chelsea, and just look at that now. Mind you compared with a current assessment of mankind, perhaps the Special One didn’t do too bad. Obviously we need to sack God, and get Guus Hiddink in to be heaven’s caretaker manager, at least until the end of the season. But thats just the point. How long is a season in heaven’s terms ? Those 7 days can’t be the same time scale as ours. For one thing there was no day or night when God started out, so how could it be measured in the same way. One of heaven’s days could just as easily be a billion earth years and so the Lords Day Observance Society should be pleased they managed to get as many rests as they did. And given the current state of football, it will probably be another 7 billion years before there’s a day when no games are played. The Football League Playoffs began in 1987 as a means of making the season more exciting by giving most of their clubs a sniff of promotion or relegation at least until Easter. They soon realised they had accidentally stumbled on a goldmine and by 1990 the play off finals had been condensed to a 3 one off matches at Wembley over the May bank holiday weekend. Playing lip service to tradition, they kept the kick off times to 3.00 pm. The only problem with this is that the charts for these games almost invariably provided an Ascendant in the last 3 degrees of Virgo or first 3 of Libra. Given that there’s a good chance that those sign rulers Mercury and Venus would be in either Gemini or Taurus at the time, that means the favourites to win would be… well favourites. 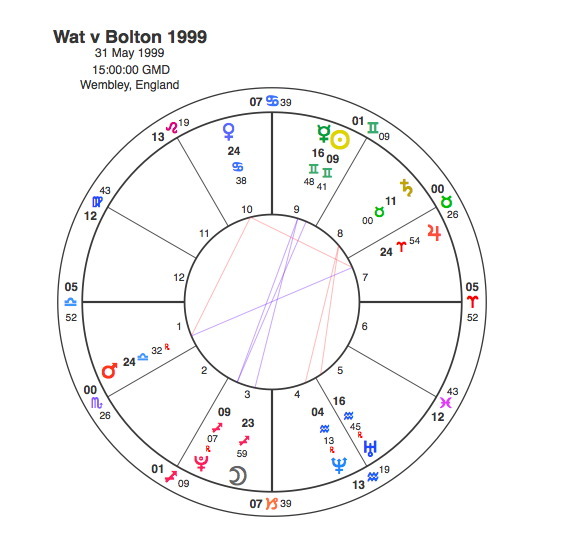 However as we all know both horary and contest charts are unsafe for judgement in the first and last 3 degrees of a sign, prediction becomes very tricky. As if it wasn’t tough enough for the most stressful one off game in the world. The Football League Championship Play Off has been estimated at being worth about £ 100 million or £ 365,000 trillion if your level of journalism is the same as creationism, like Rupert Murdoch. Since the first one at Wembley there have been 26 Championship play off finals. Capricorn Research has tested a simple method for predicting results in major one off football matches – the contest chart. The favourites are signified by the Ascendant ruler and their opponents the Descendant ruler. The Moon’s next aspect shows the winner and if it is separating from one of the significators, they will lose. The only problem is to decide who is the favourite, particularly between teams that have been separated by only the odd point or two. The simple answer is to take the club that finished the main season higher, even if thats just on goal difference. These matches are notoriously difficult to call because there’s so little between the teams. Most pundits say its a lottery and it just depends on who performs on the day. Using the contest chart method, astrology would have predicted the winners 18 times out of 26. That’s pretty impressive and more than enough to come out on top at the bookies. However 15 of these matches were played at times with early or late Ascendants. In those 15, the Moon would have picked the winners 10 times. 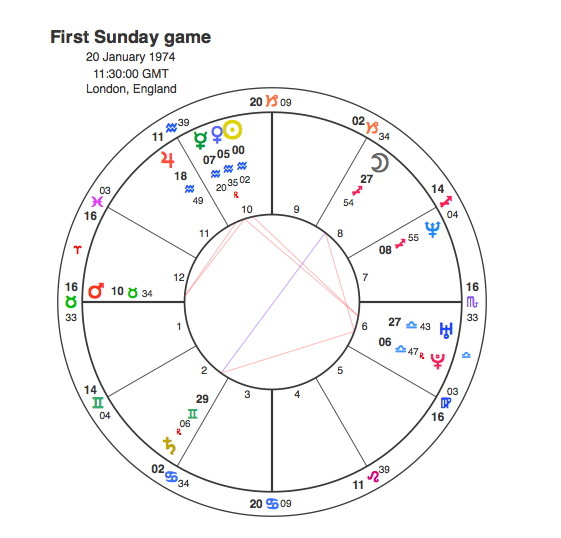 Which leaves 11 charts that are safe to judge under the old horary system. Of these 11 matches, this simple method won 8 times. And one of those defeats can’t really be counted because the chart was obviously pointing in a different direction. The Moon is applying to a sextile to Mars for Bolton, but Mars is in opposition to Jupiter as part of a very tight T Square ( all three planets are within 1.5 degrees ). This pattern points to an apex Venus for Watford, so the chart is saying victory for the favourites. So that makes it 9 – 2 to the contest chart. In fact the two that didn’t make it could easily be explained by this method. In 1997 Pluto squared Palace manager Steve Coppell’s Moon as they beat Sheff Utd. And in 2000 Pluto opposite George Burley’s Sun helped Ipswich to the Premier League at Barnsley’s expense. And given that promotion to the play with the big boys is such a massive pay out, any manager with a Pluto transit at the time would have to win. So having made these little adjustments, astrology wins 11 – 0. The Moon is separating from a sextile to Venus and applying unimpeded to square Mars so it should be a shoe in for the underdog. Which looking at the tables at the moment is not great for my home town club, Brighton who are comfortably 3rd. If they make it through to the finals, it looks like they would lose. So fingers crossed that they make the top two. Although given that Saturn will be going through manager Chris Hughton’s Sagittarius stellium next season, it might not matter much anyway. Either they will go up and a squad nowhere near strong enough to survive the Premier League will do an Aston Villa, or a play off defeat and a disappointing next season may see Hughton get the sack. Then we’d have to get Hiddink in after he’s finished managing heaven.